The Berthold Electric Generator Connection Cabinet (also known as a “tap box” or “generator docking station”) is a quick-connect station for a portable generator or load bank. Once it’s installed, you’re ready for quick, easy, and safe connection of a portable roll-up temporary generator to provide backup power in an emergency or during a planned outage. 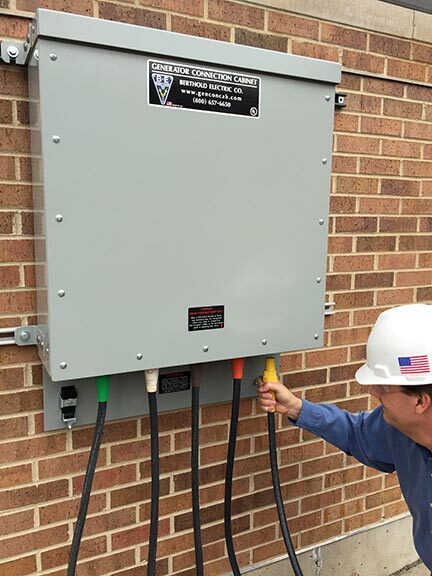 For facilities that already have on-site backup power, use a Generator Connection Cabinet for additional redundancy during permanent generator repair or maintenance, and/or for annual load bank testing. For your reference, download our PDF Generator Connection Cabinet Configuration Worksheet here. Amps: 400 to 4,000A (UL listed max. 3,200A). System Voltage: 600V & below (UL listed max. 480V). Punching only for user-provided compression lugs. Industry-standard Crouse-Hinds E1016 series color coded Cam-Lok connectors. Constructed of rugged, corrosion-resistant aluminum (or optional stainless steel). Available in wall mount or pad mounted design. Maintains NEMA 3R rating during use – with portable generator cables connected. High quality construction designed for ease of installation and use. Locking lift catch and padlock provision provide security. Generator Connection Cabinets shall be Underwriters Laboratories, Inc. listed under UL 1008: Transfer Switch Equipment. Enclosure shall be provided with SouthCo lockable latches on the Cam-Lok access door. Internal bus shall be sized for 1000A/sq. in. ampacity, and bus work shall be supported with UL Recognized Component (QEUY2) insulators. Enclosure shall be either stand alone pad mount or wall mount NEMA 3R, aluminum or stainless steel construction. 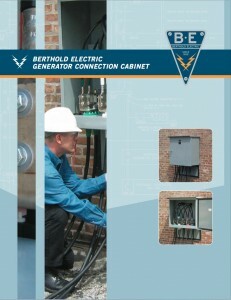 Generator connection cabinets shall be manufactured by Berthold Electric Company of Chicago, Illinois. Please feel free to contact our engineering staff for application assistance. Berthold Electric Co. - manufacturer of premium quality electrical power distribution equipment since 1925. You can also download the PDF Configuration Worksheet here and give us a call Toll-Free at 800-657-6650 or 312-243-5767. In most cases we are able to respond with a quote by the end of the following business day. UL listed since 2007, Berthold Electric pioneered the Generator Connection Cabinet as far back as 1968! © 2019 Berthold Electric Company. All Rights Reserved.